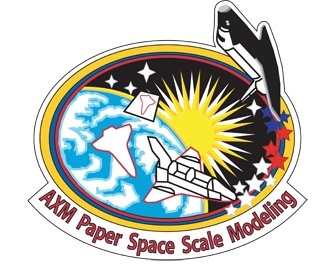 My name is Alfonso X Moreno, owner and self-taught graphic designer of AXM Paper Space Scale Models website. This blog is an extension of my website. Mainly, all updates to the International Space Station papermodel will be discussed here. Also, updates to the Russian segment will also be presented here and EVA’s. This blog will also cover background information of new papermodels. Hi Tim. I haven’t completed the Pegasus yet. On this blog I’m planning to post my progress on Pegasus soon. You’ll be the first to know about it. I’ll let you know. anyway keep me updated on how they are working out for you. I hope to see the Pegasus on the website soon. what else is planned for the new year any other new paper models. I have been busy at work and haven’t had the chance to complete this project. I’ll resume soon. I’m starting to put the Pegasus hull together, the tank cover is done. I will put some photos soon. The Recovery ships will be done after Pegasus. Please be patient. I’ve been watching AXM for years now and I’m finally starting to build your ISS. Impressive work and I am incredibly glad you have shared your wonderful work with us. Thank You!! Thanks for your words Keith. I really appreciate it. I share what I enjoy building. I can see that. Do you have any problems with me trying to build a decent copy of your model and donating it to the Warhawks Museum here in wonderful Nampa, Idaho? I’d love to do the whole shuttle history in paper for their NASA exhibit. I think you saw me post something like that at Zealot. Hi Tim. At this moment I can’t tell how many pages the Pegasus file will have. I will design the tug but after finding more reference material for it, though. Merci pour vos aimables paroles. I’m wondering if you have the Dream Chaser templates and the instructions up on your website. I’ve seen it in the ISS page, but I think it’s a work in progress. Will you have a model for it? It is a work in progress and it will be released when the time comes. Hi Alfonso. Yesterday I have bought yours 1:100 scale ISS paper model kit 1 to complete my future papercraft. It’s amazing work, thank you. Can I ask you which paper size do you usually use to print the scans of your model? Is it A4 (210×297 mm)? Or another? Hi Stanislav, thanks for your purchase. All my work is based on Letter size paper 8.5 x 11 inches (216 x 279 mm). Ahaaa, American standard, it will be hard to find this paper size in RF. How do you think if I will make it on A4 paper size, will this create some problems in the assembly? It seems this way the whole model will be a bit narrower, but longer. I’d never tried using an A4 paper, so I’m not sure if the pattern will fit. It’s ok. I have already found the solution of problem. Thanks for replying me. Last question: what about Rassvet module, I saw it is “work in progress”. When it will be finished? Rassvet is available in 1:100 scale only and it’s located in the Russian ISS Combokit #3. The STS-132 payload that includes Rassvet in 1:144 scale is still pending. Hi Alfonso, and thank you for these awesome models! I have one proposition for you. I think it would be helpful for us who live in Europe and are beginning to build a papermodel, if the sheets included the paper weight also in metric units. I live in northern Europe and there isn’t any place where I could buy 110 lbs cardstock from. I think 110 lbs cardstock corresponds to 200 g/m^2 paper, but I’m not even sure about that. Of course after completing first model people will know which paper is good for building models, but I think telling paper weight in metric units (g/m^2) would greatly help first-timers wondering about which paper to use. Hi Thomas. Thanks for those words. I really appreciate it. You are correct with the paper weight conversion. A 90 lb is equivalent to 165 g/m2 and a 110 lb is equivalent to 200 g/m2. You can use these numbers when looking for cardstock. If not, then try getting something close. The thinner the paper is best for small parts. For larger scales use thicker paper. Living in this country has forced me to use the American units and I have neglected not using our metric system. I am originally from South America and we use the metric system like the rest of the world. Thanks for your feedback. I guess from now on I will also enter the metric units in my model files. I’m looking for somebody who would be interested in building a few models for a Phoenix science museum; particularly a SpaceX Falcon 9/Dragon, a Delta IV/Orion and a Boeing StarLiner CST-100 – Atlas. I would like to know what are the specifications of the 90 lbs and 110 lbs paper on your pdf files in gsm (grams per square meter)? I need this info to be able to create a durable paper model with a different scale. You can choose other paper weights, not necessarily what I use. But as a rule, use thinner card stock for smaller scale model and thicker card stock for bigger and heavier models. Hello Alfonso, I’m Jeff from Oldsmar, Florida. Really excellent paper models. I’ve almost completed building the full stack of the Columbia STS-107 shuttle, with Crawler and Platform Launcher. I will send some photos for the Gallery when done. Just one question – will there be files for the MLP SRB hole pipes? Those files are overdue. I haven’t had the time to complete them but yes, they will be released. No estimate date yet. Thanks for the fast reply Alfonso. I can wait – no hurry. Maybe I’ll try making a temporary set using some NASA drawings I found online. Have a nice day. Love your site and your work here. I have enjoyed building your kits for quite sometime and have spread the word about your site to many others. Keep up the good work.